If you are worried the world will end next year 2012 based on the Mayan calendar, relax: the end of time is still far off. 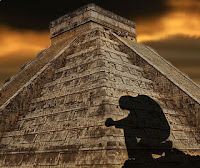 The Mayan calendar marks the end of a 5,126 year old cycle around December 12, 2012 which should bring the return of Bolon Yokte, a Mayan god associated with war and creation. "We have to be clear about this. There is no prophecy for 2012," said Erik Velasquez, an etchings specialist at the National Autonomous University of Mexico. "It's a marketing fallacy." Of the approximately 15,000 registered glyphic texts found in different parts of what was then the Mayan empire, only two mention 2012, the Institute said.